The main reason I actually started doing yoga was to alleviate a lack of mobility. I’ve had very tight hamstrings and hip flexors, partly due to heavy weight training coupled with inadequate mobility work. In the past 30 days, I’ve perceived a noticeable improvement in my hamstring and hip flexor flexibility, as well as in my ankles and shoulders. I’ve felt an improvement in my flutter kick strength/tightness, and I’ve developed a better feel for the “whip” of breaststroke kick. My legs also don’t seem to tire as quickly as a result of having a smoother kick. In addition, getting in a good stretch is great for recovery, one of the most important parts of training! Yoga is rooted in using breath control to help your body move smoothly. As you inhale, your muscles extend and lengthen, and you stretch in your joints. As you exhale, your muscles contract. 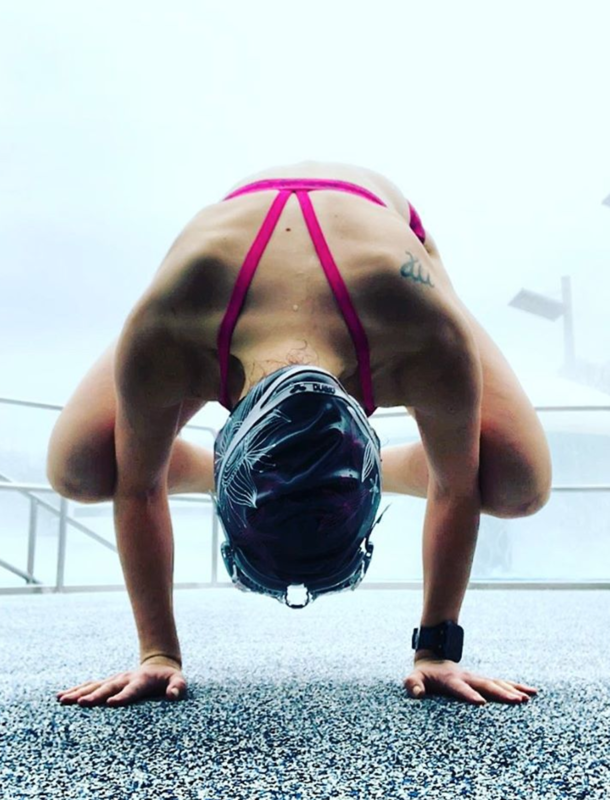 Being mindful of your breathing promotes effective muscle extension — this is especially important in swimming, where muscle extension means having a longer stroke and a stronger catch, stronger shoulder positioning, and a more whip-like kick. In addition, training your breathing increases aerobic capacity, allowing your blood to bring more oxygen to your muscles! Each of these will help you improve your feel for the water, and swim smarter (which also means swimming faster!). Another benefit of yoga is that it promotes balanced muscle development. Freestyle, butterfly, and breaststroke are all relatively heavy on the front side of your body: your shoulders and quads can be easily overworked compared to your upper back and neck and hamstrings. Yoga helps keep you balanced, making you a stronger and less injury-prone athlete. Finally, yoga has been a great way for me to exercise mindfulness and work on my focus. While doing yoga, my focus is entirely in my breath and having my muscle movements flow smoothly into each other. In the pool, strong focus on breathing pattern and muscle coordination improves the quality of your practice. Being conscious of small form nuances and how they affect your ability to move efficiently in the water is incredibly important in developing good habits. These things need to become muscle memory by race time! This type of deeply focused workout has benefits outside of the pool, too. As I’ve started to value mindfulness more, my ability to focus on other tasks such as studying has improved, too. My brain feels clearer and fresher, and who wouldn’t want that! If you’re looking to mix up your dryland program, I highly recommend you look into yoga! I haven’t found other training methods that yield the same benefits that I’ve gained from yoga, and it will definitely keep a central role in my routine in the future.